No.. Because technically.. he is still her age... just been her age longer than her.. get it? Because he knows about Alice's vision! Ah! He thinks he is a monster and doesn't want to bring Bella into it. I thought it was cool and made me love him even more lol. Now, everynight I wish Edward would climb through my window ! Hmm.. Edward is constantly arguing himself. I have this feeling that he just talks to himself outloud lol. So maybe, a little bit of both. Protecting her and being honest with himself. I knew he was innocent. 1918, people didnt just go around doing stuff. It was WAY different back then. For some reason this didn't bother me b/c he's like frozen at that age. Also, Bella likes those novels from his time era. So she probably liked the men in these books as well. I think it just enhances it for her...his 'old english' talk, again chivalry is not dead!!! Also, it works out b/c they are both extremely mature for their age. He is afraid it will creep her out about him. Also, I think at this time in the book it may be a little painful for him to be a vampire. I think he craves to be human so he can embrace her w/o having to hold back his vampire urges. I later had that confirmed thanks to Midnight Sun. Sort of not fair since I'm answering this post Breaking Dawn, but at the time when I was first reading twilight, I thought about Bella having something special. I thought that it would have something to do w/ either her mind or her always seeming to be calm. B/c it is Edward, it did not surprise me. I actually assumed this a long time before it was brought up. I think both. He is being honest w/ himself b/c it took a lot of willpower w/ that first kiss and he is knew at the whole 'human' thing. Bella attacked him at their first kiss. What's to say she wouldn't if they were more intimate. They he might not be able to fight her off. So for those reason's and more, he is also in a sense trying to protect Bella. I never ever thought Edward was not innocent. I'm not even sure where ppl could get that from. If he wasn't that might have thrown the whole book off. Look at the time era he grew up in...young ppl that were never married just didn't do it back then...it was morally and ethically wrong!! I wasn't phased by his age at all. I guess it seems "natural" (for lack of a better word) for a vampire to be that old and not look it. He says that is one of his most vivid memories, and I think it's probably difficult to talk about. He also probably does not want to scare her, or give her any ideas about becoming a vampire. I've already read Breaking Dawn so I already know the answer to this. 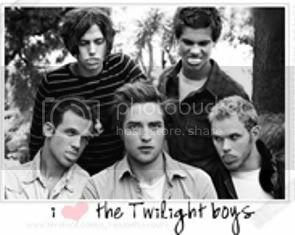 However, when I read Twilight I never really thought about it. I guess I figured if she ever became a vampire she would probably have a talent, it would make her an even better match for Edward. For like half a second I was a little creeped out lol, but then I remembered that he really didn't have anything better to do at night. I also suppose that he was probably worried about Bella and that was how he made sure she was safe. So in his own way it was sweet. I think its a combination of both. Edward is incredibly strong and being intimate with Bella would put her in danger. He knows he has to be careful with her physically so he has to control himself, and by being honest with himself he is protecting Bella. If I think of Rob Pattinson as Edward it's hard to believe that Edward has never been with anyone else. I'm not sure why that is, it just seems less likely. However, Edward in the book I definetly believe is a virgin. The time period he grew up in would have reinforced the idea of waiting until marriage. Since he was only 17 when he was turned changed he would have still been waiting for the girl. So yes I believe he and Bella are equally innocent. Not really. And all of the turn-of-the-century comments from earlier in the story make even more sense now. Something she doesn't need to know. Having read Breaking Dawn, I know her trait, however even until then I still couldn't figure it out. New Moon broke a little light on it, but I really had no idea. This may just be me, but speaking as a Twiguy, I can totally say that watching a girl sleep is amazing. I think the sleep process makes people even more interesting, because then there is no self control on what is said. Both, because he could turn involuntarily turn carnal on her and kill her accidentally. So keeping it basic he has control. I think 18 was actually considered adulthood a century ago, so it very well could have been possible for him to have had some sort of serious relationship, given Rosalie's story later on. I always kind of thought he probably did with some girls earlier on but just grew disinterested in them over time and everyone was people to him. Though I did believe this was his first serious relationship. i think its because he was thinking that if bella ever had to be transformed he didnt want her to know how much it really hurt and change her mind. 1. What were your first thoughts about Edward's age and human history? Were you creeped out at all that he was so very much older than she was? At first I was a little creeped out that he's technically over a 100 years old. But I got over it very fast. 2. Edward tells Bella very little about the process of becoming a vampire. Why do you think he chose to keep this from her when he is being so very open about everything else? At first I didn't realize that this was the one thing he's trying to keep from her. So I didn't have any ideas or anything. 3. We learn that many vampires are gifted with supernatural traits. Stephenie has told us that vampires are drawn to special humans, and therefore when those humans become vampires, their special qualities are enhanced. If that is the case, I simply must ask the question everyone one of us has asked at some point. If Bella were to become a vampire, what would her trait be? And is it possible for her to not have any special trait at all? Since I've already read BD I know what it will be. But beforehand I never really though about if she became a vampire what her gift would be. 4. Edward lets it out that he's been watching Bella as she sleeps. Again, did this creep you out or make you fall even harder for Edward? It didn't creep me out, especially after finding out the reasons. It's kind of sweet that he can just sit there & listen to her sleeptalking and not be bored or want to do anything else w/his extra time. 5. Edward says two possibly conflicting things in this chapter. First, he explains that in the last few days, he has put mind over matter and has been able to control his thirst for her - that the temptation isn't as strong. He later says that he doesn't think it would ever be possible for them to have an intimate relationship because it would be too difficult for him to control himself. Do you think he's being honest with himself, or do you think he's just trying to protect Bella again? He's probably just being protective. 6. Along those same lines, we learn that both Edward and Bella have never had a real relationship with another person before this. Many people have debated the issue of Edward's virginity, and that has been put to rest by Stephenie herself. Did you think that maybe Edward had been intimate before, he just hadnâ€™t had a real serious relationship with anyone he loved, or did you get it right from the start that he was just as innocent as Bella was in this matter? I beleived Edward that he is just as innocent as Bella in this matter. No beacue he was rased in a diffrent time and he's a proper gentalman. So that she doesn't get ideas, lol. And also, a slight part of him probably doesn't want her to know incase it puts her off becoming one herself, despite how much he tries to deny that idea. I knew that she would have to have a special trait when she became a vampire, but I didn't know what it could be. Fall even harder. I had read Dark High Noon before though, and I thought it was a bit creepy when I read him watching her for the first time. But then I thought about his reasons, and by the time I read it through Bella's eyes, I thought it was sweet in a very intense way. Then again, he's not your average human creepy stalker, is he? If it was anyone else it would probably be completely odd. Maybe I'm biased. A little bit of both, but more trying to protect Bella. He obviously knows how much more tempting she is when he's touching her, and how that would just increase the more intimate they got; but on the same hand, he would want to warn Bella straight off so that she didn't end up having her hopes crushed. And to remind her again that he is dangerous to her. No, I got it right away that he was as innocent as Bella. In fact, if anything I think he's probably more innocent than Bella. I think there's more likelihood that she had a boyfriend, or something resembeling one, when she was much younger and now doesn't class it as being serious at all, than that Edward had been intimate. After all, he was a distracted 17 year old who believed in marriage first when he was changed, and then spent the next few centuries avoiding human contact and Tanya, despite her interest. I sort of expected it. With the way he talks and behaves, it was clear that he was not born recently. It didn't creep me out. After all, he is still 17, and also Bella is quite mature. First of all, because it is a painful memory for him. And second, because he does not want to think about that happening to Bella. He doesn't want her to think about becoming a vampire either. Having read Breaking Dawn, I don't have anything to add about that. I have to admit, nothing Edward ever did creeped me out. It just suits his character and personality. I thought it was cute and sweet. I think we have to look at this as entirely separate things. Edward sees that he can repress his lust to taste her blood, so that he can be her boyfriend and kiss her and touch her. So I do not think that he is mainly afraid that he will loose control and bite her if they are more intimate, I think it is just as much that he could kill her just by accident. Since he is so strong, he can crush the bones in her body just like that without even realizing it. So I think he is in control of himself, but being intimate is a whole other area. And it is that fact that he doesn't know what to expect during an intimate act, and so can't prepare himself like he can on a daily basis. I always believed that Edward was just as innocent as Bella. First of all, he was raised in the early 1900s, where an intimate relationship outside of marriage was uncommon. And he was only 17 when he was changed. Secondly, you can tell by the way he is so insecure about how to do things, how to be close to Bella, and wondering if he is doing it right. I think he really appreciates that Bella is innocent too. In other words, Edward was completely innocent. It never even crossed my mind that he might not be, seems impossible to me.